The State alleges that the accused assaulted the Coligny teenager after accusing him of stealing sunflowers from their employer. 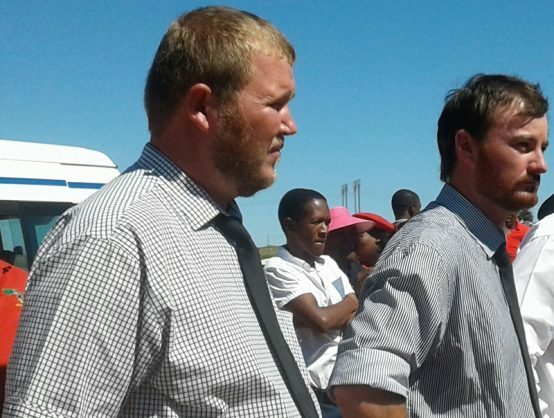 Phillip Schutte, one of the two men accused of killing a teenage boy in Coligny, is expected to continue with his testimony at the North West High Court in Mahikeng on Wednesday. Schutte, 34, and Pieter Doorewaard, 27, are accused of killing Matlhomola Mosweu, 16, at a farm near Coligny in 2017. The State alleges that the men assaulted Mosweu and threw him out of a moving van, on April 20, 2017, at Rietvlei farm near Coligny after accusing him of stealing sunflowers from their employer Pieter Karsten’s sunflower plantation. Karsten is Doorewaard’s uncle. The pair maintain that he was not pushed but, jumped out of the moving van. On Tuesday, Schutte told the court that they did not have contact numbers for the emergency medical services on their cellphones and that they decided to go to the Coligny police station to report the incident and request the police to call for an ambulance. Schutte told the court that there was no space for Mosweu to sit with them in front of the van as it was a single cab. He added that Mosweu did not look scared or frightened and they were not expecting him to attempt to flee while the van was in motion. Doorewaard closed his case on Tuesday, after he called two cellphone experts and a trauma specialist to testify in his defence.